Courtesy of Diamond Comic Distributors, here are the nominees for the Diamond Gem Awards of 2017, to be voted on by comic book retailers in the direct market. A few changed since last year – The Publisher Of The Year marketplace percentage qualification has shrunk from 4% to 3%. To keep IDW and Dark Horse on the list amongst Premier publishers? Dynamite also often goes over 3% though… can’t they just go Premier and Non-Premiere? Also the Comic Of The Year price split has switched from under $3 and $3 and over, to over $3.99 and $3.99 and under. 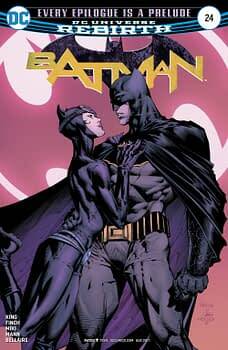 Which will allow the twice-monthly popular DC titles to go head to head with Marvel’s ongoing comics.